You visit your dentist in Temple twice a year and even set up reminders on your phone to make sure you don’t miss your appointments. And because you care so much about your teeth, you know that there are lots of important steps to follow to maintain your oral health between visits. But, are you missing anything? 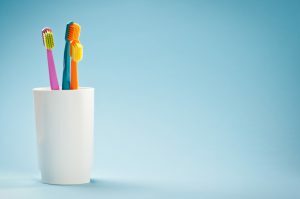 In this post, the team at Fossum Dental Group can make sure your at-home smile regimen is up to par by sharing their expertise on the best ways to keep your teeth healthy. What Are The Best Ways To Maintain My Smile Between Dental Visits? Dr. Richard Fossum recommends that patients follow the strategies below to keep their teeth as healthy as possible between visits. And since there’s no substitute for professional dental care, be sure to see us at least twice a year for preventive services like exams and cleanings – remember, an ounce of prevention is worth a pound of cure when it comes to your smile. Sounds easy enough, right? Be sure to brush gently for two minutes twice a day. Many patients will brush for a shorter amount of time, but with more pressure, thinking this will get the job done. We caution against this – brushing too hard can cause gum recession and leave your teeth vulnerable to decay and cavities. If you’re unsure about your technique, watch this brushing tutorial video. Did you know that brushing alone leaves almost half your teeth surfaces without proper cleaning? Flossing is essential to optimal dental and overall health, and it’s a key part of preventing gum disease that causes tooth loss. Floss at least once a day, and make sure your technique is correct and watch this short flossing video. If you use tobacco products in any of their forms, stop now. Not only are you putting yourself at risk for cardiovascular disease and deadly lung problems, this unhealthy habit is the leading cause of oral cancers. And, it stains your teeth, contributes to gum disease, and causes bad breath. Be sure to protect your teeth on the inside and outside by enjoying a well-balanced diet. Avoid sugar in foods and beverages (like fruit juices and sodas), since this causes tooth decay and enamel problems. Instead, make water your beverage of choice, and load up on leafy greens and dairy products that are packed with calcium. Cheese is especially great since it helps protect against cavities. Straight teeth are healthy teeth. Since proper alignment protects teeth from injury, decreases the chances for gum disease, and increases self-confidence, Invisalign or braces from our team can give you the perfectly aligned dentitions you deserve. Now that you know the best ways to care for your teeth, schedule your appointment with Fossum Dental Group today to learn more great tips from us when we see you in our office!